Pour components into an old fashioned glass almost filled with ice cubes. Stir well. Garnish with the orange wedge. As an option after chilled, pour liquid into a martini glass. 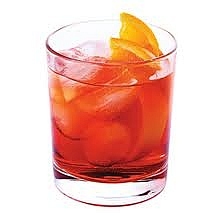 The Negronito – Mix as above yet, substitute Gin with Tequilla and Compari can be substituted with Aperol. Most widely reported account is that it was invented in Florence, Italy in 1919, at Caffè Casoni, ex Caffè Giacosa, now called Caffè Cavalli. Count Camillo Negroni invented it by asking the bartender, Fosco Scarselli, to strengthen his favorite cocktail, the Americano, by adding gin rather than the normal soda water. The bartender also added an orange garnish rather than the typical lemon garnish. … aka, the Americano – their original predecessor. Take two parts Italian vermouth and one part Campari (or in another recipe, one of each), mix them with ice and add Pellegrino or soda water and a slice of orange, and you have an Americano.